In the age of digital photography, photographers on the go know that keeping charged is an essential consideration. Whereas most cameras use batteries for power, Sony recently revealed a unique looking device that is powered by kinetic energy! The latest in the company’s Odo line of green gadgets, the Twirl n’ Take camera is charged by giving its circular head a spin. Resembling a magnifying glass or flower, the Twirl n’ Take’s rolling head provides power by transforming kinetic energy into electricity. The device apparently takes decent photos, although it takes about 15 seconds of rolling to charge for a picture The camera is installed in the handle, and as the device has no screen, one uses the hole as a viewfinder. As an extension of the Twirl n’ Take’s floral form, Sony decided to create a cute flowerpot to act as the camera’s docking station. In addition to its battery-free design, the camera is composed of biodegradable vegetable-based plastics. Needless to say, we want one! I really like the concept the fact that it has no screen means that you have to think through your composition and lighting as you would if you were using a film camera.Its a shame that people who have posted before me are so negative about this idea. I haven't understood how this gadgets work and how to operate it and what the relative between it and a battery http://www.canon-digital-camera-battery.co.uk/batteries/sony-dsc-p200b.htm? I find the concept very interesting. Though this would definitely make for a lousy camera, I would love to see this sort of technology incorporated into more serious cameras in the future. It's useless now, but who knows where this sort of tech would lead us in a few more years of development. In the age of digital photography, photographers on the go know that keeping charged is an essential consideration. Whereas most cameras use batteries for power, Sony recently revealed a unique looking device that is powered by kinetic energy! 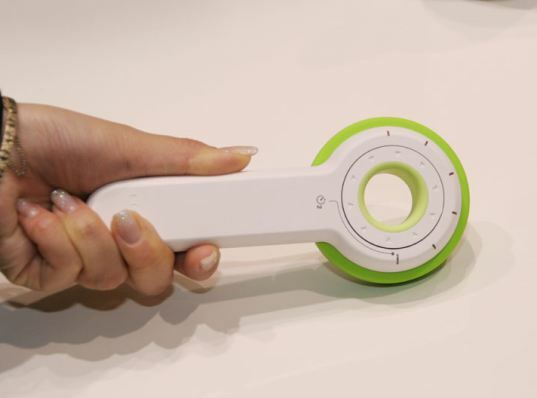 The latest in the company's Odo line of green gadgets, the Twirl n' Take camera is charged by giving its circular head a spin.